Not many people post about Fred Olsen, maybe because so many passengers are returning guests, on this cruise over half those on board had silver Oceans club membership or above, so Fred must be doing something right. We were on our fifth cruise and third with Olsen, also our second on the Balmoral The itinerary to the Canaries was similar to our previous time but we did not mind because we like most of the ports and the purpose was to celebrate a big birthday somewhere warm and at sea. It turned out to be a special experience. On the birthday morning the ship docked in Lisbon which we think one of the most beautiful arrival settings in the world and the sun was shining to give us a great day out with lunch on a restaurant terrace. Back on the ship in the evening there was the traditional Fred Olsen birthday cake and greetings at dinner. I had been advised when booking to have my birthday treat package on a sea day, so the champagne breakfast came the next morning complete with smoked salmon, fresh fruit and all the trimmings. Also included is a photo session with the ship’s photographers which resulted in some lovely photo memories to bring home and we have them on CD so can print all that we want. I would recommend a Fred cruise to anyone with a special anniversary or birthday to celebrate. Back to the practicalities: embarkation was the easiest we have ever had, parked in sight of the ship and were on board by 1.30 with all the luggage. The only down side at the beginning was that we were assigned the 8.30 dinner which we tried once but it really does not work for us. So top marks to the maitre d’ and his assistant for giving in to my pestering and reassigning us not just to the 6.15 sitting but also to the (as I think nicer) restaurants on deck 10. I have to say I think the quality of food is not as high as it used to be, on our first cruise back in 2012 on the Black Watch we were really impressed but not this time. 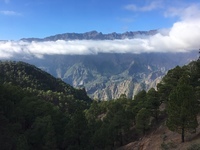 There were 3 new port calls for us (but in the event only two as one was dropped at the last minute): the Unesco biosphere island of La Palma where we went on the excursion to the magnificent volcanic crater. A spectacular visit, just marred by the guide having to hurry us all the time, as the ship only had half a day in La Palma. On the way back the call was A Coruna in northern Spain, a stylish Spanish city in a beautiful setting. The other port calls we had been to before (Tenerife, Las Palmas, Madeira, Puerto Rosario on Fuerteventura), so for those who like to make their own port arrangements, here were our ideas this time: Madeira: walked along a levada; Tenerife: shopped in El Corte Ingles; Las Palmas: hired bikes to cycle along the prom; Fuerteventura: wandered into town for a coffee (again only half a day but you wouldn’t want any more). As before with onboard entertainment, we rate the ship show company and orchestra really highly. We often find the regular bands better than the featured artistes, but this time were impressed by trumpet player Leo Shavers, and also by some good classical concerts. I’m not sure if Fred Olsen has given up on sail away parties, but there weren’t any, and we missed the fun of those occasions. Finally disembarkation, the speediest ever, we were back in the car and on our way out of southampton by 8.45. In summary, the cruise more than met our hopes and expectations. Ps there was a problem with norovirus cases but generally special arrangements were dealt with graciously and effectively by the crew. Not many people post about Fred Olsen, maybe because so many passengers are returning guests, on this cruise over half those on board had silver Oceans club membership or above, so Fred must be doing something right. We were on our fifth cruise and third with Olsen, also our second on the Balmoral The itinerary to the Canaries was similar to our previous time but we did not mind because we like most of the ports and the purpose was to celebrate a big birthday somewhere warm and at sea. It turned out to be a special experience. On the birthday morning the ship docked in Lisbon which we think one of the most beautiful arrival settings in the world and the sun was shining to give us a great day out with lunch on a restaurant terrace. Back on the ship in the evening there was the traditional Fred Olsen birthday cake and greetings at dinner. I had been advised when booking to have my birthday treat package on a sea day, so the champagne breakfast came the next morning complete with smoked salmon, fresh fruit and all the trimmings. Also included is a photo session with the ship’s photographers which resulted in some lovely photo memories to bring home and we have them on CD so can print all that we want. I would recommend a Fred cruise to anyone with a special anniversary or birthday to celebrate. Back to the practicalities: embarkation was the easiest we have ever had, parked in sight of the ship and were on board by 1.30 with all the luggage. The only down side at the beginning was that we were assigned the 8.30 dinner which we tried once but it really does not work for us. So top marks to the maitre d’ and his assistant for giving in to my pestering and reassigning us not just to the 6.15 sitting but also to the (as I think nicer) restaurants on deck 10. I have to say I think the quality of food is not as high as it used to be, on our first cruise back in 2012 on the Black Watch we were really impressed but not this time. There were 3 new port calls for us (but in the event only two as one was dropped at the last minute): the Unesco biosphere island of La Palma where we went on the excursion to the magnificent volcanic crater. A spectacular visit, just marred by the guide having to hurry us all the time, as the ship only had half a day in La Palma. On the way back the call was A Coruna in northern Spain, a stylish Spanish city in a beautiful setting. The other port calls we had been to before (Tenerife, Las Palmas, Madeira, Puerto Rosario on Fuerteventura), so for those who like to make their own port arrangements, here were our ideas this time: Madeira: walked along a levada; Tenerife: shopped in El Corte Ingles; Las Palmas: hired bikes to cycle along the prom; Fuerteventura: wandered into town for a coffee (again only half a day but you wouldn’t want any more). As before with onboard entertainment, we rate the ship show company and orchestra really highly. We often find the regular bands better than the featured artistes, but this time were impressed by trumpet player Leo Shavers, and also by some good classical concerts. I’m not sure if Fred Olsen has given up on sail away parties, but there weren’t any, and we missed the fun of those occasions. Finally disembarkation, the speediest ever, we were back in the car and on our way out of southampton by 8.45. In summary, the cruise more than met our hopes and expectations. Ps there was a problem with norovirus cases but generally special arrangements were dealt with graciously and effectively by the crew. A bit small, but spacious enough, nicer decor since the refit. View from window fine. Good location on the ship as quiet but in easy reach of main theatre, prom deck and lifts to observatory. But note, distant from all dining options. Television choice much improved since our last time on this ship. Did not use the ship wifi but it is now available in cabins. Sockets are European 2 pin. The ship was scheduled to go to gran tarajal, but in the event called at Puerto del rosario instead. this was disappointing as it is nothing special, though a pleasant enough town for a wander. A Coruna as it is called in Galician, is a large city and port in a wonderful setting. The historic centre is pleasant to walk around and there lots of stylish shops. we chose to walk out to the tower of Hercules lighthouse which is probably the only option if there is only half a day. In hot weather, the town beaches would be walking distance from the ship. Dramatic and beautiful. As promised we left in rain clouds and arrived on the west side of the island in brilliant sunshine. A pleasant walk to the view point, with many spectacular views. You can do this excursion independently, but with little time (only half a day) and our first time on this island we took the ship excursion and were well pleased. Would have liked a lot more time at the Caldera. There is quite a walk to get out of the port in Las Palmas, and two cruise ships in as well as Balmoral. We have done the bus tour on a previous visit (not recommended, get the public bus to the old town and explore on your own). This time we rented bikes so as to cycle along the port promenade. They had electric bikes and we wish we had rented them as it was very windy and so quite hard work cycling. Hiring was easy, and very reasonable, I think we paid 6 euros per bike for 2 hours hire. Helmets are provided. We love Lisbon. every time we are there. The entry to the port is spectacular, the berth is near the centre, public transport is great and easy to access and there is so much to do. Lisbon is wonderful for food and restaurants, we had a lovely terrace lunch at the &apos;Royal Cafe&apos;, reasonable price and interesting food. A lovely port call as there is so much to enjoy, and it is all easy to access. The cable car is walking distance and very reasonably priced, but this time we repeated what we had done 5 years ago by walking on the town levada (starts near the football stadium) and back via the coastal prom, having lunch along the way. Getting out of the port is not so easy in Santa Cruz, there was shuttle but we managed to miss it. Ship stayed into the evening which was great, meant we could sunbathe and swim in the morning and then disembark in the afternoon. As we know Santa Cruz already, we chose to go to the very large branch of upmarket Spanish department store chain El Corte Ingles, partly in order to visit the food hall to buy the special Spanish food we like to take home with us, and it was the January sales so some good bargains but very crowded.